KPMG Europe’s internal information security conference – Hacknet, was held in Berlin and lasted two days, the 29th and the 30th of April. This year, it was Ionut, Daniel and me who had the privilege of representing KPMG Romania. Our team arrived in Berlin on the 28th. After taking our luggage to the hotel, we went for dinner, followed by a short walk in the city. The conference kicked off early on the 29th and the program for the day consisted of three presentations and the CTF competition. First presentation was on Relaying Contactless EMV, by a colleague from KPMG NL. After an introduction to smart-cards and EMV, the speaker described the concept of Relay Attacks on Contactless Transactions. Afterwords, he showed a video illustrating his Android implementation of the attack, the novelty of his approach being the small time overhead incurred by the relay. Measurements showed that the duration of a relayed transaction was very close to the duration of a native transaction (sometimes, due to optimizations, even faster). Next up was Martjin Verbree, ex-KPMG, now acting as Director for Localz Europe, presenting on Modern Beacons. Localz uses these devices as a technological foundation for delivering, among other, improved customer experience. You can find more about Localz here. The guys at Lastline filled the last available slot of the day with a technical presentation of their product. After lunch, everyone gathered to hear the rules for the event’s CTF. The attendees were split into six hacker teams and two seeker teams. 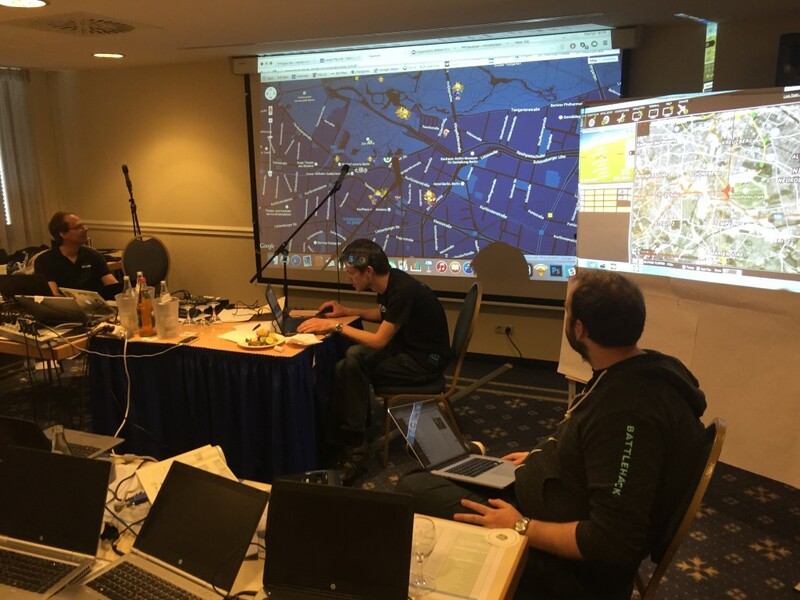 During the first phase of the CTF, the hackers competed against each other in a treasure hunt around Berlin. Armed with a map and the Hacknet app installed on their smartphones, but only allowed to travel by foot, the hackers were supposed to find the 15 beacons installed around the city and solve the challenges which were fed to the Hacknet app while in proximity of the devices. Meanwhile, the two seeker teams’s task was to locate and uncover hackers around the city. 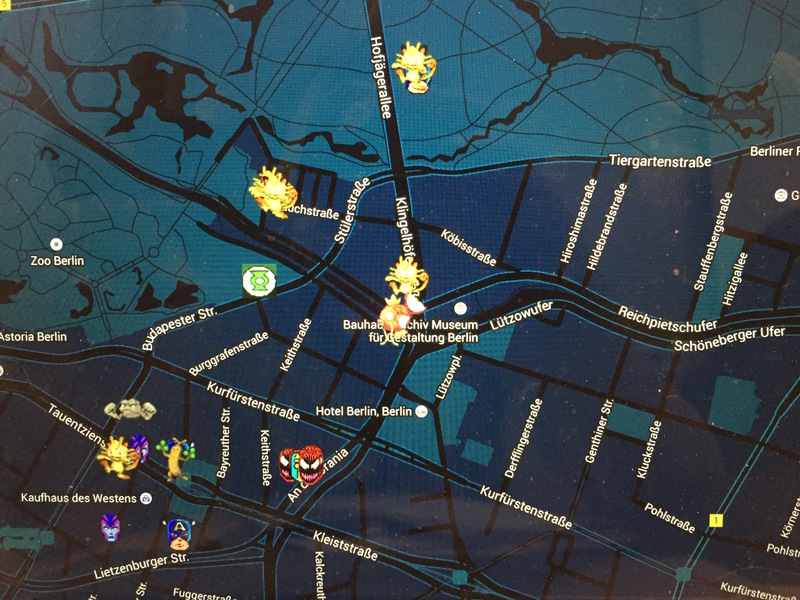 While it is true that seekers were devoid of the map, they were allowed to follow the hacker’s movements on a screen installed at the conference HQ . Also, seekers were allowed to make use of any kind of transportation. The colleagues from Localz also provided their view of the first stage of the CTF here. The second phase of the CTF started after all the challenges received during the first phase were solved, and engaged the teams into a battle to solve more challenges and gain control of a UAV. This rogue UAV was threatening KPMG Berlin HQ, so the first team to control and land it safely on Tegel Airport became the righteous winner of the competition. The CTF finished a bit late and was followed by a tasty dinner. Afterwords, our team called it a day. The second day of the conference was focused on presentations. The first slot was reserved by a colleague from KPMG IT, with an interesting presentation on HTML5 injection attacks. Next, two talks were from our team: Ionut gave a presentation on PHP Object Injection, expanding on a blog post he’s previously written for Security Cafe, while Daniel presented on XML-based attacks. Since he promised to write a blog post on the topic, I will not provide you further details. After a short break, two colleagues from KPMG NL shared their Red and Purple Teaming experience in a lively presentation. They were followed by another colleague from KPMG NL, with a presentation focused on raising awareness on the risks associated with employees failing to maintain the same level of security awareness in handling company-owned mobile devices, as compared to laptops and workstations. After an interesting presentation on security of IOT from KPMG IN and a KPMG NL selection of recent InfoSec news, with insights for keeping up-to-date with the field, a colleague from KPMG NL shared his passions for UAVs and the technologies behind the second phase of this year’s CTF. Next was a colleague from KPMG FI, with a presentation on Trusteq, a Finnish company specializing in identity and access management which was recently acquired by KPMG. The following slot was reserved for a presentation on SAP Security Assessments and vulnerabilities identified by one of our colleagues from KPMG NL in the process. After the regular Hacknet Queen ceremony and a closing talk from the organizers, our team headed straight to Tegel Airport. The 2015 edition of Hacknet was a successful event which managed to gather attendees from all over the world. As always, the organizers created an environment fit for knowledge exchange as well as for networking. I look forward to the next edition and would like to take the opportunity to thank everyone involved in making this year edition happen.